The L88 Corvette is one of the most sought after Corvettes. It was only offered for three years (1967-1969) and 1967 was the only year for the second-generation bodystyle to receive this monstrous engine. The L88 was a 427 cubic inch (7.0-liter) V-8 that was all aluminium. You could get other 427 Corvettes, but this package had lightweight everything and a really high compression ratio which required 103 octane (!) fuel. Chevrolet tacked on some additional required goodies like Positraction, heavy-duty suspension and brakes, and they graciously deleted the radio and air conditioner (so people would be less tempted to drive it on the road – it was supposed to be a street-legal race car). All of these extras (or deletions) tacked on about an extra 35% to the purchase price. Which might explain why only 20 were sold in 1967. That makes this one of 20 C2 Corvettes with this outrageous engine and option package. Horsepower was rated at 430 but dyno’d at 560. 1968 and 1969 L88 models trade for about $500,000. 1967 models are significantly more expensive and this one should bring around $1 million. Click here for more info and here for more from Barrett-Jackson in Arizona. 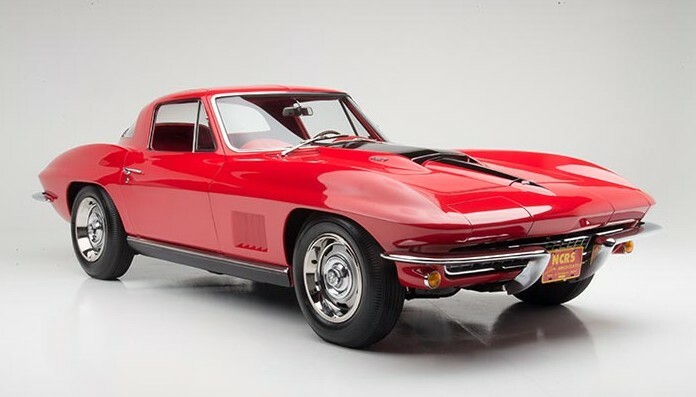 This entry was posted in Uncategorized and tagged 1967, auctions, barrett-jackson, cars, chevrolet, classic cars, corvette, coupe, l88, muscle cars by classiccarweekly. Bookmark the permalink.